Built by Supermarine at Westlands in the United Kingdom during 1942. Assigned Royal Air Force (RAF) serial number EE853. Painted in a desert camouflage scheme. Disassembled loaded aboard SS Sussex. and shipped overseas to Australia, arriving at Adelaide during April 1943. 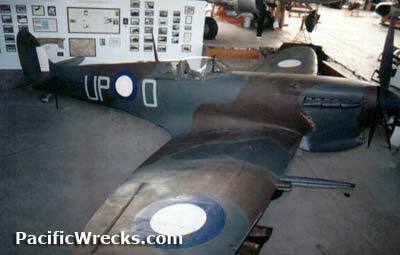 On April 20, 1943 assigned Royal Australia Air Force (RAAF) serial number A58-14.6 Merlin engine M46 number 93751. Assembled by 1 AD. During June 1943 to 13 ARD RP. On June 18, 1943 took off piloted by Sgt A.E. Byrne, 411741 on ferry flight bound for Gurney Strip near Milne Bay. While landing, this Spitfire overran the runway and damaged the aircraft. Pilot Byrne was unhurt. On June 22, 1943 transfered to 10 RSU for repairs and the next day assigned to 79 Squadron. Coded UP-O. Repainted in a foliage green color scheme. On August 28, 1943 took off piloted by Sgt Pilot Alec Chomley, 418232 this aircraft experienced brake failure and and impacted a earthen bank at Vivigani Airfield on Goodenough Island. Pilot Chomley was unhurt in the crash. On September 8, 1943 transfered to 26 RSU. Never repaired, this aircraft was officially written off on September 16, 1943. Until 1972, this aircraft remained where it was abandoned at Vivigani Airfield. During August 24-25, 1972 salvaged by Langdon Badger using local labor to transport the fuselage, wings and tail to the dock 11 miles away. A crate was constructed and additional Spitfire parts found in the area were recovered and shipped to Adelaide. Restored to static condition at Parafield Airfield. Additional parts came from farms near Oakey Airfield. Other parts from Merauke. The propeller and radiator fairing came from a crash site 40 miles south of Darwin. Also, some bits from Guy Black in the United Kingdom. A Merlin 46 of 1415 hp is used as it engine. 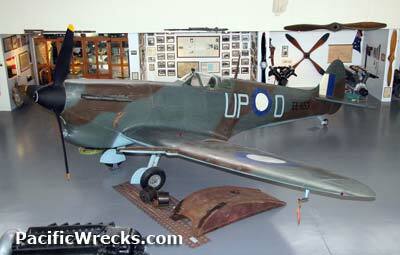 Painted in the origianl markings of Spitfire A58-146 Tail Code UP-O , the aircraft was initially displayed at Badger's residence. In August 2001 the aircraft was put on display at South Australian Historical Aviation Museum, on loan from Langdon Badger, along with memorabilia displays to photographic records to personal accounts.